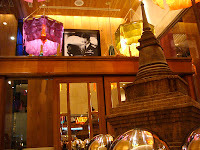 When Chedi Luang opened, 10 years ago, Thai restaurants in Osaka only served Bangkok-style food. “We filled that gap,” said supervisor, Chieko Suzumoto. “Bangkok cuisine is food-stall based, whereas Chiang Mai cuisine is the royal, restaurant-style Khantoke. Neighbouring countries – Laos, Myanmar and China – have an interesting influence on the regional cuisine.” Chiang Mai, located 700 km north of Bangkok, was the capital of the Lanna Thai kingdom in the 14th century and is the cultural centre of Thailand, like Kyoto is to Japan. Elaborate, Lanna Thai-traditional Khantoke meals are served to guests at ceremonies and celebrations on khantoke pedestal trays used as tables, similar in style to Japan’s traditional kaiseki cuisine. I was first served Nanprik Wannii, a Khantoke-style platter of cucumber, carrots, broccoli, beans and other fresh vegetables eaten with a hot, spicy, tangy sauce (taste before dipping or you will be breathing fire) and a mild, nut sauce. A friend recommended I try the Kung Nangfaoa Chae Nampla. The raw tiger prawns in nampla fish sauce, garlic, chilli and mint looked harmless until I put one in my mouth. Said friend’s head may have “exploded with delight”, but for me it was instant bliss. The remainder on the plate disappeared quickly. Your mouth will be tingling from the spices, so cleanse your palate before you eat on with a glass of Thai wine, Thai beer – Singha and Chang – or tea. I also tried another Chiang Mai specialty, Kao Soi Gai, a Laos-style chicken curry over flat noodles, topped with crispy noodles piled like the stupor for which the restaurant is named, Wat Chedi Luang. Usually yellow, the noodles are green and red for Chedi Luang’s 10th anniversary. This curry is not hot or runny like Thai curries, so season it to taste with lemon, onion, cabbage pickles and chili oil. A popular dish with women is Puu Nim Pad Pong Karii, soft-shell crab stir fried with egg and curry. Of course, Chedi Luang offers popular Thai dishes, too. Their tom yum kung is made with menam sweet river prawns, which have long legs and make a delicious broth. Opened in March 2011, the furniture and the gold interior at the Herbis ENT branch makes you feel royal. The tableware and the objects incorporate designs and patterns for which Chiang Mai is famous. The view of the Umeda Sky Building at night adds to the feeling of occasion, ideal for special occasions, dates or if you want to splurge. Both branches offer a 90-minute lunch buffet serving 15 dishes on weekdays and 20 on weekends and public holidays. They also offer a one-hour all-you-can-drink Heineken Extra Cold beer option for an extra 998 yen. The chefs can adjust the dishes spiciness and to accommodate pescatarians. Closed: when Herbis ENT is closed. Text: George Bourdaniotis, Photos: Courtesy of Chedi Luang. Originally published in Kansai Scene #141, February 2012.